Let’s cut right to the chase today. I am pumped for this year! In my own real life, the high school scholastic bowl team I coach is going for its third straight conference title. My little history club has cool topics they are making projects on for the history fair at NIU in late February. When it comes to the Cubs and their system, I am equally as excited! 1. I am excited to see this youth movement begin to play out. As fans, you should see some results this summer in places like Eugene and Mesa. However, Nico Hoerner looks to be the quick riser. I am hoping he starts at AA, but if he doesn’t, I don’t think A+ Myrtle Beach holds much of a challenge for him. 2. I am excited to see some starting pitchers make their debuts in the majors. Trevor Clifton and Adbert Alzolay should both get a few spring training starts with the big league club. Both are probably behind Alec Mills in line, but things do change. To be quite frank, Adbert should be ahead of Mills despite missing 2/5 of 2018. I would love to see Adbert coming out of the pen once summer gets here and it warms up. He could be filthy in the majors in that role. 3. 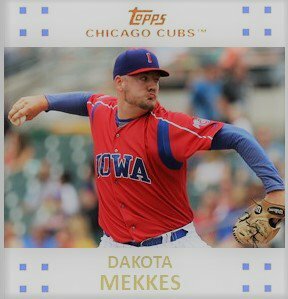 Will Dakota Mekkes finally get a shot at the bullpen in Chicago this summer? My answers are yes, yes, and yes! 4. I spend most of my time covering Eugene, South Bend, and Myrtle Beach. I am a little pumped in January to cover them in April. 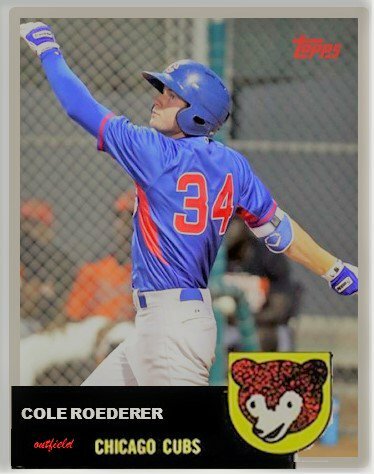 One reason is that Cole Roederer and Brennen Davis could be at South Bend. Both 2nd round picks are young and exciting possible 5 tool guys. The second reason is that the 2019 rosters of all three class A affiliates are not set in stone. There is going to be a lot of competition to earn a valued spot on a roster and in a starting rotation. 5. Comebacks and breakouts are always fun to cover. This year will have its fair share of both. Hopefully, this is the year DJ Wilson finally puts it together. I’d like to see Jose Albertos rebound from whatever happened in 2018. I’d love to see Miguel Amaya hit even more dingers and I am dying to see what Richard Gallardo can do on the mound as a 17-year-old kid. 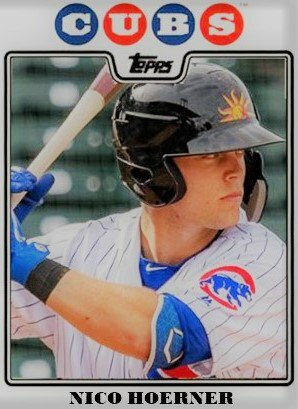 I hope that Nelson Velazquez gets off to a good start in South Bend and Jonathan Sierra hits HRs all over the Great Lakes region. And I will be thrilled to see Luis Vazquez play SS every day for South Bend. 6. I hope that 2019 will be like 2016. For the MLB club, it’s all about that deep run into October. The Cubs should contend for another World Series but a few moves need to be made for that to happen and some good health would be nice as well. There will only be a few small changes for the website in 2019. 1. The Weekly – I am not sure how it is going to breakdown, but the Sunday post should be a little different this year. I have some ideas I am letting ruminate in my head, but it has more to do with the topics covered every week. I will still be doing the players/team of the week, but I will be doing individual cards with a stamp on them rather than putting all 4 in a wallpaper. 2. All-Star Teams – Instead of making Google Slides Presentations embedded in a post this year, I will be returning to straight up list posts. That change is due to that I can piggyback pictures via my top secret burner account on Twitter that I use just to load baseball cards and save space on WordPress. 3. Interviews – I usually don’t get a chance to get to too many games in April and May. This year is different. South Bend will be playing in Clinton, Iowa the first week in May. I will make it to those games. Then, after the draft, I will be getting a chance to see South Bend again in July up at Appleton and again in Beloit. 4. I have never been into the daily recap thing. I still am not. I cringe at its very thought. 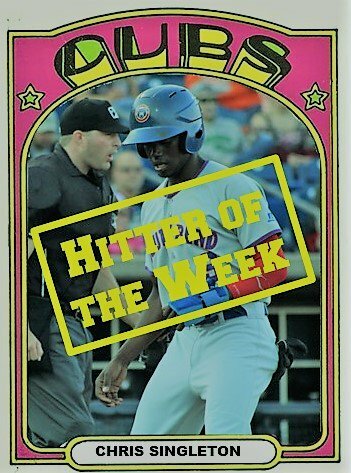 However, this year I may do a very short thing every morning called “MiLB Players of the Day.” I have been doing it on the Facebook account page for a few years. I pick a hitter, a starting pitcher, and a reliever every day. The time is right to make it on here. I am debating if it should have its own page from the menu or whether it should be a post. I am leaning “page” as of today. 5. I plan on sneaking off to Iowa in early June. I hope to get in a couple of day games and do some picture taking and interview a few prospects, depending on who is there. I cannot remember the last time I was at Principal Park. There should be a lot of good stuff coming your way. Happy New Year, Todd! Looking forward to your coverage in 2019! Go Cubs! Happy New Year to you, too! And I am looking forward to covering all I can.